Health and Beauty: Know what are the natural products most commonly used by the cosmetic industries for their line of beauty is now at your fingertips. Health and Beauty: The addition of chemicals makes these products are not all good, as the dyes, acids, aromatic substances, among others, eliminates completely the properties of the base product. Health and Beauty: For this reason, we provide you with what are the best options to be able to keep your skin smooth and healthy, marcarillas and deodorants to be always beautiful with the natural products used in cosmetics most expensive on the market. -Baobab oil: Rich in amino acids, fatty acids and vitamins (especially alpha and beta carotenes). Can be used as a natural moisturizer, as it returns to the epidermis of the face, body and neck its elasticity. It can also be used to lighten the skin blemishes and stretch marks. -Jojoba oil: it Can be used as a moisturizing facial conditioner of dry skin, bath oil, lotion, aftershave, hand lotion, removes make-up, for before and after sunbathing and as a massage oil. -Apricot: Due to its high content of vitamin A and iron plant, can be used in face masks for skin care. Its oil is effective in the treatment of stretch marks and wrinkles. 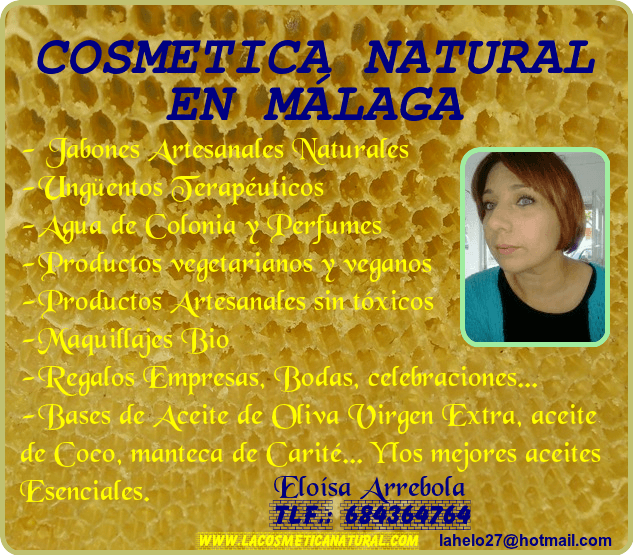 -Honey: it Is considered an ingredient essential for the basic care of the skin. Mix it with yogurt or egg to nourish, hydrate and soothe. -Clay: it Is used, especially the white clay, in baths, cleansing and facial masks, treatments for the breasts, to close the pores and tighten sagging skin. The clay finely ground also serves for cleaning the teeth. You can perfume with pennyroyal or some other herb. -Walnut leaves: The resulting boiling for ten minutes (a handful in half liter of water) is an excellent deodorant, which is applied daily to the underarms with the help of a compress soaked. Keeps in the refrigerator. Health and Beauty: These are some of the that gives us the mother nature that you can use to keep you beautiful naturally and without spending more. It is the perfect combination to keep your skin healthy and radiant. It is a mask that eliminates impurities, exfoliates, hydrates and rejuvenates by its great amount of vitamin E.
You only need 10 ml of wheat germ oil and one tablespoon of honey. Put in a container made of glass or plastic the wheat germ and honey, then mix with a wooden spoon or plastic, avoid using containers or spoons made of glass. You must first perform a washing of the skin, do not use soap to clean your face, you can be with cream or lotion, it is removed with wet wipes and then rinse with warm water to open the pores. Then apply the mask of wheat germ and honey, leaving it to act for about 20 or 30 minutes. Then remove with a damp towel and ends with the washing of face with cold water. You can apply the mask three times a week. We then take the peel of a banana this ripe, as they will have increased amount of potassium, and use the inner part of the same, rubbing it gently for about two minutes against the teeth. The minerals contained in the inner part of the peel like magnesium, potassium and manganese are absorbed by the teeth and this process produces the whitening. The procedure is performed two times a day, preferably after lunch and at night before going to bed, increase the number of times per day we going to whiten the teeth faster. There are other methods of whitening of natural teeth, as baking soda, but most contain some type of acid or abrasive, which can cause problems even though the product is all-natural.